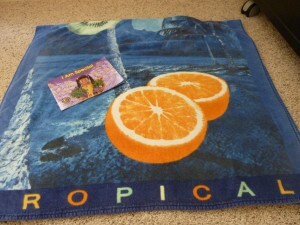 A fun way to make a reading station more inviting – set out a beach towel! So easy and basic but provides a specific location for the reading to take place, makes it a bit more fun and adds an element of pretend as you pretend to be lying on a beach somewhere, soaking in the sun and reading. 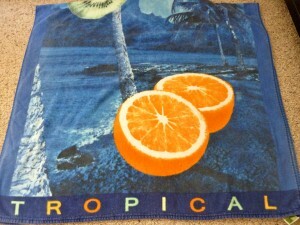 I incorporate summer themed books, either fiction or non-fiction depending on what Andrew is into. Since this is a station activity, I would recommend choosing a short book or just reading a portion of a book. I also suggest looking through the book and making an earlier station activity one that includes some words they may across. This could be through a word memory match or matching up a word with a clue about its meaning. Ex. We read the Frog and Toad story “Cookies” from Frog and Toad Together by Arnold Lobel. 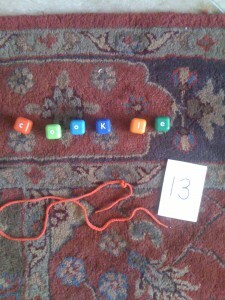 I had Andrew use letter beads to string together the word “cookie” as well as used the pictures from the story to make a sequencing station to help with comprehension (this could be done as a pre-reading activity to give context or afterwards as an activity to see if he understood what happened in the story.). Choosing a word or theme from the story to string with letter beads. These are just two basic ways to incorporate literacy skills into other station activities in addition to a reading or listening station. Reading or listening stamina needs to be built just like other skills (speaking from experience here!). I have spent a good deal of time reading out loud while Andrew runs around the room. 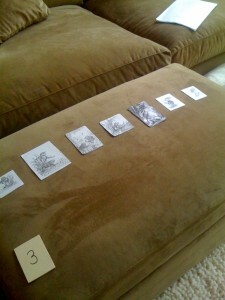 We started with small “plug-ins” where he would have to come over and point at something in the picture while I read aloud. Once I knew he could read something, we would take turns reading pages (slowly extending his time) and now he is able to read a few pages in picture books before he needs to get up and move. While building reading and listening skills, don’t be afraid to take turns or bookmark the page and end the reading/listening station on a positive note. Doing this as a My Obstacle Course station is perfect because they know it will be quick and there are other stations waiting for them when they’ve completed this one.